You'll be able to make your own Move levels in LittleBigPlanet 2, just not straight out of the box. LittleBigPlanet 2 won't have full Move compatibility when it ships in January, but it will come with a Move flavoured appetizer that will give players a taste of how the game might play with motion controls. Media Molecule's community manager James Spafford said that the game will ship with fairly sizeable Move-enabled demo. Anyone who has Move will be able to play the ten or so levels on the demo and then shortly after release, Media Molecule will release a Move-only DLC pack, and give away the controls so people can build their own Move levels. From the way that Spafford is talking, it doesn't sound you'll be able to just grab a Move controller and play the game as normal. It sounds like levels that use Move will be their own thing, separate from the main game. 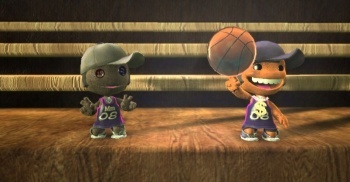 It's possible that rather than using move to control Sackboy directly, it'll be used to manipulate the environment to keep him safe as he runs towards his goal, much like the LBP2 co-op demo at this year's Tokyo Game Show. LittleBigPlanet 2 will be released for PlayStation 3 on January 18th.